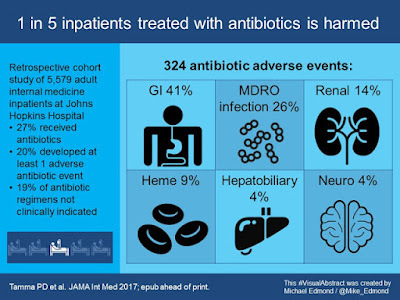 A new, important paper in JAMA Internal Medicine from Sara Cosgrove's group at Johns Hopkins demonstrates the collateral damage of antibiotics. In this retrospective cohort study of 5,579 internal medicine inpatients, 1,488 (27%) received a parenteral or oral antibiotic for at least 24 hours. The most common indication for antibiotics was UTI. Adverse events due to antibiotics were captured over the 30-day period after antibiotic initiation, with the exception of Clostridium difficile infection and multi-drug resistant organism infections, which were captured over the ensuing 90 days. Median duration of therapy was 7 days. Of the patients treated with antibiotics, 19% had no clinical indication for antibiotic therapy, and 20% developed at least one associated adverse event. The breakdown of adverse events is shown in the visual abstract below (note: for this analysis, I combined the 30- and 90-day outcomes). We are becoming more cognizant that antibiotics are not benign therapies. Kudos to Sara and her colleagues for their work in raising our awareness.